Rodamón Barcelona is centrally located on a beautifully renovated 20th Century building in the centre of the city, close to Gaudi's La Pedrera, Casa Batlló and high-end shops of Passeig de Gracia. Rodamón Barcelona creates a local, homelike environment in one of the nicest locations in Barcelona. Once you get in, you will automatically feel like at home – everything is included: comfortable beds, lockers, linens, Wifi, large common areas with fully equipped kitchen, relaxing area, laptops available, games and TV, plus an amazing terrace! Located in the very center of Barcelona, right next to the beautiful gardens of Palau Robert and Passeig de Gràcia, Rodamón Hostel is the place to be if you are looking for an authentic barcelonian experience – We host our guests both in private and shared rooms up to ten people. Rodamón has been favourably compared to a hotel, with 'spotlessly clean', 'smart-looking and comfortable' rooms and dorms and 'beautiful, modern minimalist décor'. Each of the bunk beds has a power socket, personal light and dark curtains so you can have a comfortable sleep and enjoy your privacy while staying in a dorm. We also offer 24 hours reception and yes, we will keep your luggage. Check in starts at 2:00 p.m. Rodamon Hostel has a 24/7 reception. The whole payment shall be done at the check in; cash, credit or debit cards accepted. Check out is until 11a.m. You are welcome to leave your luggage in our free storage room. Cancellations must be made by E-mail at least 2 days before your scheduled arrival day. If you miss this deadline, we are entitled to charge the an amount equivalent to the Charges applicable to the full amount of the stay at the Hostel. Customer may cancel the Booking without charge if notice is given to Rodamón Hostels at least 48 hours prior to 1400 hours (local time) on the Arrival Date. 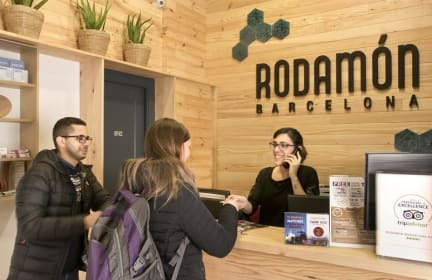 In which case Rodamón Hostels will refund to the Customer all sums paid by the Customer in advance except those paid to Hostelworld as booking deposit. Where the Customer fails to give sufficient notice of cancellation as per clause 1.1 or fails to arrive (no show) at the Hostel, the Booking will be deemed cancelled and the Customer must pay the Hostel an amount equivalent to the Charges applicable to the full amount of the stay at the Hostel. Rodamón Hostels may at any time cancel a Booking if the Hostel becomes unavailable due to circumstances outside Rodamón Hostels’s control in which case Rodamón Hostels will pay the Customer a full refund of any Charges and any booking fee paid except those paid to Hostelworld as booking deposit. The property may ask for a pre authorisation of your credit card, if it is does not work, the guest would be contacted in order to update his/her credit card details. If the guest does not answer within 72 hours, the Property will have the right to cancel the booking. Check in starts at 2:00 p.m.Rodamon Hostel has a 24/7 reception.